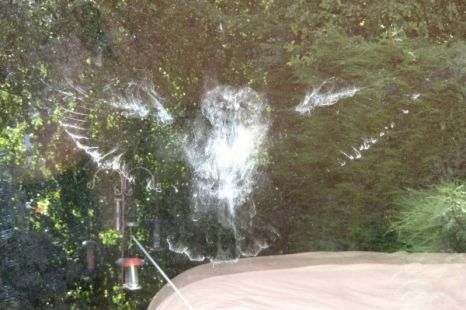 A lady in Britain was shocked to return to her property to find the ghostly imprint of an owl on her bedroom window. The spooky silhouette clearly shows the bird of prey’s feathers and facial features. Sally Arnold of Kendall, Cumbria who discovered the ghostly image believes that it was created when the owl accidentally crashed into her window. Experts say the imprint was created by the powder down that protects growing feathers.